Do you get CAT presents? ...not do you get presents for the cat, like treats and toys. But do you get cat-type things from family, friends and co-workers because they know you have a cat and think you will like everything cat-ty? My mama has cat mugs, potholders, dish towels, magnets, jewelry, figurines and lots more, all gifts. :? If you do, what do you get? Ooo... mama\'s gotten lots! Let\'s think... we\'ve got a woven trivet type thing in the shape of a big cat, a ceramic cat trivet, a little wire cat that holds a tiny terracotta pot (but mama doesn\'t DO plants... hehehe), a glass cat with two tiny goldfish, a cat charm for her bracelet, windchimes with cats, and oodles of figurines and what-nots. Mama loves kitty stuff! Oh, a three cannister set of kittens in a basket, a set of books on animals, a little \"I love cats. They taste just like chicken.\" sign (it was a joke)... she\'ll probably think of more later... MOL! Mom wishes she did. Mom LOVES cats but somehow her family still hasn't gotten it through their head that she loves cats and doesn't want people figurines. She has a ton of those little angels holding Children but for once she would like someone to get her a cat figurine or a cat themed mug or something like that. Maybe this year will be the year. Oh yes. Mom gets cat stuff all the time. Last year grandma found her a entire nativity scene with all cats. It's cute! oooh Mom bought that nativity scene for herself last year. Its really cute. 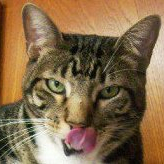 Reuben, maybe your mom\'s family thinks you cats are her \"angels\" so they get her angels. My mom gets cat stuff all the time from family members and even co-workers! On her birthday, one of her best friends at work agve her two cat key chains and a cat watch! she has gotten cat calendars, t-shirts, cards...One of her bosses had two Persians and would give mom stuff all the time like lapel pins, cat dishes, figurines, and mugs. Mom also gets a lot of cat books. She likes those. One of the best cat presents she got was a paint by number kit of me! They took my photo and ordered the kit. She hasn't started it yet but soon! This is Delyte. My person gets everything cat, especially from her former boss. And she gives cat presents too. This year she is giving a set of glasses with clever cat sayings on them to her sister, and other cat presents to friends who own cats. Plus we give cat presents to other cats and get them too. Our person's friend in NE makes catnip mousies for all of her cat owning friends and we hear that there are four of them coming our way. My person especially likes cat jewelry and earrings--she has several sets of black cat earrings made to represent me and a few others to represent Stella plus a few that don't match any cats she owned. She used to have a black cat and a calico cat and there is a famous painting of that so she got reproductions of that. Oh yeah. Last year, Mommy got a sweatshirt that said "Life is better when shared with a cat", which couldn't be more true, and she says it couldn't be more comfy. She also got a kitty snowglobe, since she collects snowglobes, that has kitties inside, and outside, and shaped like a teapot and plays "My Favorite Things" she loves it, but she's been telling people, NO MORE KNICKNACKS!!! She's running out of room, and NO MORE SNOWGLOBES!! As much as she loves them, the snowglobe cabinet is MORE than full! She also got a stuffonmycat.com calendar. Now, this is the weirdest thing. . . one year, her friend gave her a knicknacky thing, it's a pink cat, with a swirly tail, that holds rings! Mommy doesn't have very many rings, so she just uses it to look purrty. She also got, one year, a kitty, and it's tail is swirly and made of wire so you can put little pics in there, but it's always falling over, so she doesn't even put it out anymore. Then one year for her birthday, her friend gave her something called Kitten Toppers, to put on plant pots, lamps, whatever. I LOVE the meezer one, I keep knocking it off the lamp! Grandma broke one of them, and one of them refuses to stick. It's supposed to clap on to something with it's paws Weird, huh? A few, lots of tuxedo cats. Sometimes people paint a stripe down the back-MOL! Mostly mom gets Dalmatian stuff, that's her favorite animal. We don't take it personally. She loves us too.